There is plenty of evidence that nature is good for us, but how does being in nature impact on our emotions, body and wellbeing? Our latest paper, just published open access in Evolutionary Psychological Science, presents a model and supporting evidence to show that nature regulates emotions and the heart. This brings balance to our feelings and the nervous system that controls the function of our body, and organs such as the heart. Balance of emotions brings wellbeing, and regulation of heart rhythms helps heart health. This is the story of how nature helps keep us well. To explain the benefits of nature we need to understand our emotions and their underlying physiology. 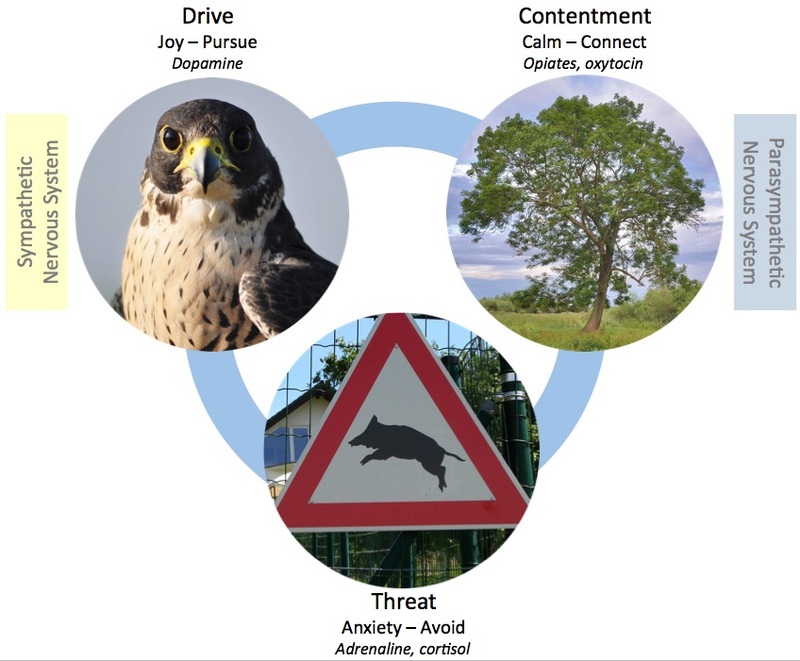 A simple way to do this is to represent these systems with 3 circles – represented here by a falcon, ash tree and wild boar warning! Drive – positive feelings required to seek out resources, and nowadays achieve success at work or in leisure. It’s about a wanting (that can bring joy and pleasure) as we pursue things (as a falcon does). Contentment has an affiliative focus bringing different positive feelings, for example safety, soothing, affection, kindness and a positive calm with the way things are (represented by the ash tree). Anxiety – feelings and alerts generated by the threat and self-protection system. Located in the fast-acting amygdala this system can be both activating and inhibiting (represented by the wild boar warning). Each dimension brings different feelings (such as anxiety, joy, and calm), motivations (avoid, pursue and rest) – releasing various hormones in the body. For wellbeing we need a balance between the three dimensions – happiness and satisfaction comes through balancing threat, drive and contentment. For example, when our threat response is overactive, an unbalance caused by being constantly driven for example, our positive emotions are reduced and we can become anxious or depressed. Paul’s work used this ‘3 Circles’ model as a foundation for Compassion Focused Therapy, used to overcome mental health issues. Our paper shows that it can also explain how exposure to nature effects our body, our emotions and our well-being. We re-analysed previous research (mostly Japanese Shinrin-yoku or forest-bathing studies) that had compared how the body reacts to being immersed in nature (woodland), to being in an urban environment. These studies measured heart-rate variability – an indicator of activity in the branches of the nervous system that controls the heart. Although these studies found differences in the responses to both environments they didn’t consider them in the context of emotional regulation – how nature links to emotion, physiology and well-being. Nor did they have compelling explanations for some variety in the results. The results of the analysis supported the story told by the 3 Circles model. Finding that being in the woods was calming – activating the parasympathetic nervous system associated with contentment. Whereas the urban environment stimulated the sympathetic nervous system associated with drive and threat. We can see how exposure to nature can bring balance, calming us after a busy day in the city, for example. As ever the story is a little more complex. Some people weren’t soothed by the woodland, others were stimulated by it. Again, the 3 circles can help explain this. Some people could experience threat in the woodland, feeling anxious about what lies in the undergrowth – is that a boar rustling? Those more in tune with nature could feel joy (rather than calm) at being asked to spend time in the woods – at any time an exciting falcon may fly past! It’s also worth considering our work on connecting people with everyday nature. Forest-bathing is not a daily option for most, but the soft-fascination of nature is there in towns, it just needs us to pause for a moment and make a little effort to notice it – to connect, rest and feel calm. Understanding how exposure to nature impacts our bodies and how this links through to mental well-being helps establish the types of activities in nature that are most beneficial. Exposure to nature is emotional – emotion is the constant companion of sensation with feelings, rather than thoughts coming first when we encounter it. And these emotions have a physiological basis – which nature and well-being research often overlooks. Such knowledge and models can guide us, for example in the types of natural spaces we provide for people – moving from green spaces, to green places where a soothing contentment in nature can be found. 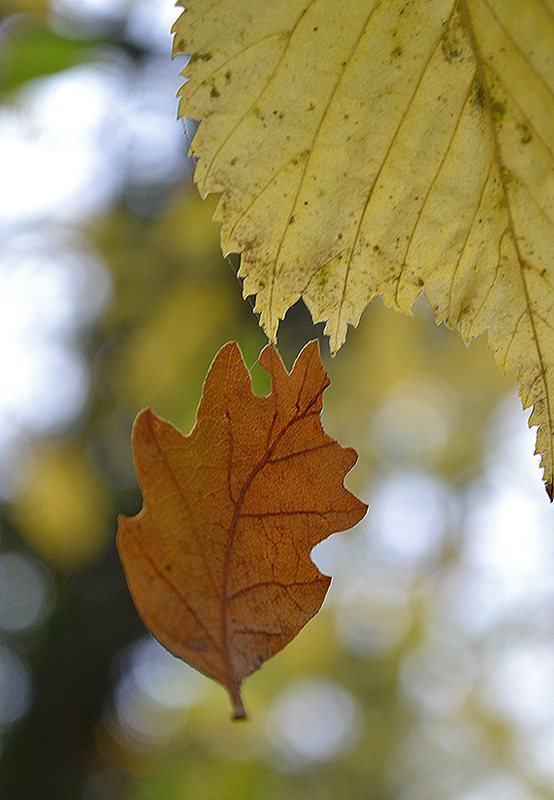 Realising we can move beyond identifying nature to finding joy and calm – and balance in nature. In sum, research evidence supports the use of the three circle model to explain how the body reacts to exposure to nature. The model is also easily understood in the context of our everyday lives, providing an accessible physiological based narrative to help explain the benefits of nature – the neurophysiological and evolutionary basis provides a compelling argument to convince others of the role of, and need for, nature in our everyday lives. PS – There is also a story of our evolution to be told. The branches of the nervous system can be linked to different evolutionary responses. For example, visceral reptiles simply responding to threats and opportunities to the more evolved self-soothing and social behaviours of mammals. This provides a link between time in nature, physiological state, emotions, psychological experience and social behaviour. These stuff are really amazing. I am happy that I came across your blog to learn these things. Now, I have something to share to a friend which is currently taking up a course in almentor about Life Coaching.